Manual Cleaning Systems. These sytems come standard with all of our pool packages and are perfectly adequate to clean your pool. But if you want to do a little less work, read on!!!!!!! Automatic Pool Cleaners - A cleaner can eliminate almost all manual cleaning of your inground pool, leaving more enjoyment time for your family. 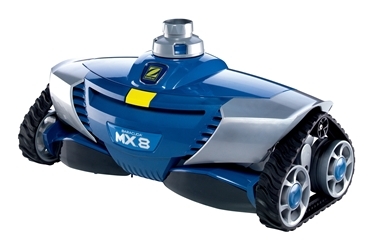 We sell a suction side cleaner which works particularly well with our inground pools or a robotic cleaner for complete pool care. Let us help you navigate the complicated world of pool cleaners. The pool cleaner to the right is a great suction side cleaner. The next pool cleaner to the right is a great robotic cleaner made by Aquabot with a 4 year parts and labor warranty! These automatic cleaners range from $500-1,000 for the very best in their categories...but don't forget to read about the $200 solution below!! Pool Buster/Blaster. A recent development in pool cleaning technology is the Pool Buster/Blaster. This device is a self contained battery powered vacuum that attaches to a telepole. For those who have an automatic cover, the typical cleaning during the season is some sediment and a few leaves. 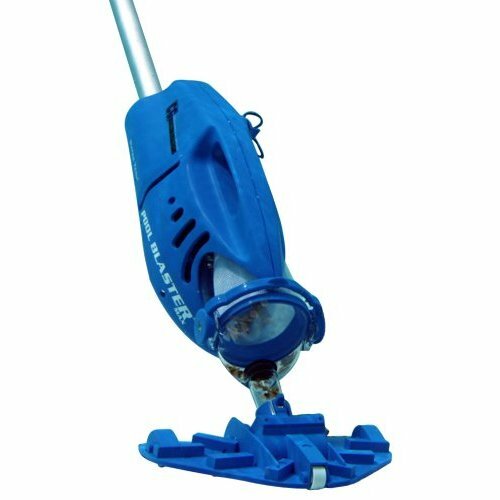 This cleaner is light weight and easy to use and perfect for small clean up jobs, maybe even less work than an automatic cleaner in many situations. Psst...these are only about $200 for a good one!